I don’t typically read a lot of ‘Southern fiction’ or women’s fiction, but there was something about this intriguing cover and description that lured me in. But when Annabelle’s world starts to collapse around her, she discovers that nothing about her picture-perfect family is as it seems. 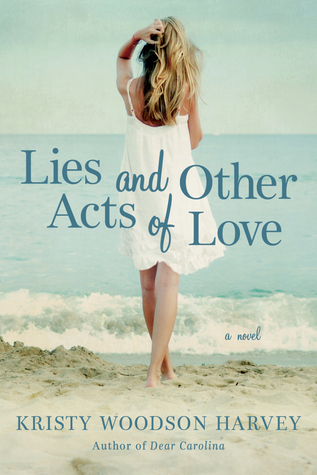 And Lovey has to decide whether one more lie will make or break the ones she loves. I mean who doesn’t think this description sounds intriguing?!? I’ve been married for 12 years and I totally could relate to Lovey’s philosophy…..but as we find out sometimes the little white lies aren’t always the best way to go…..however brutal honesty isn’t always the best either. This story is told from two different perspectives, Annabelle and Lovey. I loved how the past and present mixed together so seamlessly in the narrative. While most of the story is told in the present, the past still has a haunting presence which I felt was important to the complexity and richness of the story. This is my first experience with Woodson Harvey’s writing….I hear that her debut novel was outstanding. So when the author approached me about doing a review, I was excited to read something new and different with the promise of outstanding writing….how could I say no. I was NOT disappointed by any means! Her writing style is so fluid and elegant. For a second novel, I was impressed at how mature her writing was. I loved the multiple layers of the overall story and how reflective and thought provoking the overall story was. While this book is at times heavy and a bit of a tear jerker, it has it’s moments of lightheartedness and humor which I appreciated. Sometimes when a book is ‘deep’ or ‘heavy’ it can become almost overwhelming with emotion…..it’s nice when there are some lighter moments to break the constant emotion up. I loved how Woodson Harvey was aware of that and made an effort to give her readers a break when needed. In addition to the beautiful writing and plot structure, all of the characters in the story were likable and relateable. I liked that each of them were flawed in someway because it made them all the more real. I personally liked Lovey the best. Other reviewers have commented with similar thoughts and I will echo their sentiments, I loved her story because I think in this day and age it’s easy for younger generations to forget how much sacrifice a marriage really is. So many people give up when things get ‘hard’ etc but back in the day, divorce was so taboo that most couples made things work one way or another. So I thought her story was the most interesting and inspiring. I loved how the setting played into the novel itself. As I mentioned I haven’t read a lot of Southern lit but I absolutely LOVE the south as a setting, particularly when it comes to stories about families. The South just screams ‘family’ to me so this setting was perfect! I was very impressed with this story. If you are looking for something to read this spring/summer this book is a wonderfully moving book that will leave you feeling more than satisfied with the outcome! HAHAH you are too funny! And yes you are right I don’t mince words 🙂 but when I love a book, I love a book! This was great fun to read and totally put me in the mood for spring reading :)!!! Thank you for thinking of me for this one! !